Compared to its 2001 predecessor, The Cradle of Life is much more along the lines of the films (Indiana Jones) it’s trying to emulate. It’s sleeker, more engaging, and has a much better villain, among other things. Rather than wasting time in the beginning with contrived banter to set up character, this one jumps right into it. It gives less backstory, yet somehow provides us with more depth. In The Cradle of Life, Lara Croft (Angelina Jolie) is on a mission to find Pandora’s Box before an evil bio-terrorist finds it and unleashes its contents, killing millions of people. This one actually does have the potential to be a really good film in the traditional sense, but unfortunately most people will compare it to the action movies of today and standards will be too high. It’s not only highly entertaining, but knows how to stray away from formulaic beats when it counts the most. The film also tries to fill in much of the dead space with a love story between Croft and a character played by a then-unknown Gerard Butler. But this actually serves a purpose other than just a desperate attempt to grasp for more depth. Jolie seems even more comfortable with the character the second time around, and this director actually knows what to do with her. He doesn’t try as hard to manufacture her coolness–which actually makes her even more cool. It allows her persona to speak more for itself. While the first Tomb Raider was decently entertaining, this sequel is a large step above. The humor is more organic and appropriate. And less forced. The story just moves along a lot more fluidly here too. It doesn’t just complete the story with a paint-by-numbers storyboard. You can tell the filmmakers are having fun, which helps the audience join in on that. It’s a thing for filmmakers to intentionally create something poor in quality just for laughs, but writer/director Tommy Wiseau generally thinks he’s created a masterpiece. And, in a way, he has. He and the film have so much conviction every step of the way. It takes a certain type of person to make something as entertainingly bad as The Room. As evident here, Wiseau doesn’t quite understand things the way most people do. Maybe it has to do with the fact that he’s ambiguously foreign. Or maybe it’s just his odd way of looking at things. Or maybe it’s a combination of the two. Either way, it makes for ridiculous results. The movie’s premise is pretty simple. A man, played by Wiseau, and his “future wife”, Lisa, experience trouble when she becomes interested in his best friend, Mark. The fact that Wiseau plays the main character makes it even better. He’s a terrible actor. But it’s bad even when he’s not on screen because the script is so terrible, too. It feels like it’s written by someone with a 5th grade understanding of relationships. Perhaps even a 5th grade understanding of life in general–filled with cliches that don’t even make sense within the context of the film. It’s the type of movie where, if a character needs to buy flowers, you get to watch an unnecessary dialogue-filled scene where he actually goes to the store to buy them. There are so many instances where you’re not quite sure what the characters are feeling–which is weird since the script literally tells you everything going on in their heads. But the characters are constantly contradicting themselves that you can’t keep anything straight. I think it’s because, when writing the script, Tommy kept verbalizing what the audience was thinking rather than what the characters were thinking. There is so much stream-of-consciousness throughout the entire thing. There’s no sense of time or character consistencies. It’s like the lines of dialogue are never paying any attention to the ones before them. The characters keep referring to things that they don’t even know about yet. You probably don’t need to read this review to know The Room is bad. It’s one of the most famous bad movies of all time. But there are two things it does really well. It makes you laugh and it really does make you interested in how it’s going to resolve. Both of these things keep you wanting more. Most bad movies have no business being bad. But The Room has every right to be. This is a good example of a film where the premise is promising, but the outcome doesn’t really deliver. It’s actually a great kids film, but the only problem is that some scenes may be too scary for kids. Adults, on the other hand, will find the movie pretty unfunny. With Eddie Murphy in the lead role it should be way more laughable, but there’s maybe one good chuckle in the whole movie. Nonetheless, it’s intriguing in the sense that it takes place in a mysterious mansion and much of the plot being uncovered when real estate agent, Jim Evers (Murphy), and his family get trapped inside after Evers gets asked to represent the home on the market. Little do they know the mansion owner has his own agenda and secrets to hide. It’s an obvious vehicle for Disney to promote their ride of the same name. Not that we always mind it (e.g. Pirates of the Caribbean) but when a premise is stretched thinly and the film still only comes in at under 90 minutes it’s safe to say that they don’t have much to work with. And with a ride that has so much potential for a brilliant story, we get stuck with a film that doesn’t really live up to expectations. 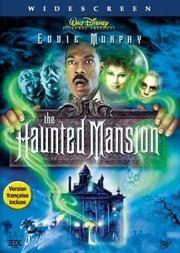 Although large portions of the film lack any substantial plot development, it’s enjoyable to watch the family explore and discover the secrets that the mansion hides. But the information that we get is received in clumps at a time. I won’t give anything away, but there is a curse involved in the movie and the details of said curse are highly convoluted and evoke so many questions to the viewer that the film loses a lot of credibility in the process. But the set pieces are great. The filmmakers do a good job replicating the feel of the ride itself. Children will be awed by the mystery of the whole story and even though they may not understand certain plot details, it will definitely spark their imagination. With a better script I would love to see Disney try this one again. Not that we can’t like 2003’s Haunted Mansion for what it is, but it’s nowhere near having a “modern classic” status. The third installment in the Terminator franchise may seem pointless to some diehard fans, but it’s actually a solid movie that furthers the premise of the series. Following the events of Terminator 2, Terminator 3: Rise of the Machines catches us up with John Connor (Nick Stahl) approximately a decade later. It turns out that the judgement day John and his mother thought that they derailed is happening anyway. Two more cyborgs are sent back in time–one to protect John and his future wife, and the other to terminate them. The movie builds upon our notions of fate and destiny and expands the universe which we grew enamored by in the first two films. Although it copies the formula from the previous film, it doesn’t disappoint. It gives us a solid addition to the franchise without losing the spirit of where it came from. And believe it or not, it even deepens the Terminator character as well. It gives us some laughs and callbacks to the previous film and aims to please fans. Sure, certain action sequences are a bit more tiresome and unrealistic, but when you have cyborg warriors I guess anything is possible. The visuals are just serene in this 2003 Pixar installment. We get a great story of love, sacrifice, and acceptance. The film already captures our attention in the first act with some tragic events. But the great thing is, we’re sucked in despite the absence of the movie’s great characters. This is back when Pixar, much to our good fortune, used to rely on its plethora of fun characters. While nowadays they’re just seeming to become less musical Disney films. 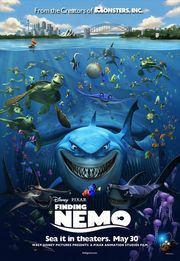 But Finding Nemo is when Pixar first started making its influence of Shrek known. The jokes become more abundant–both subtle and forthright. The comedy took greater risks and involved more self-parody and a little more potty humor. Before Shrek, animated movies were all trying to mimic what Toy Story did–provide us with a very classy story and warm comedy. And nowadays those films strive to find a happy balance between Toy Story and Shrek. But Finding Nemo doesn’t shy away from warmth either. The oceanic cinematography makes you feel like you’re in the ocean as well. You even develop a good sense of direction of where everything is. The characters are about as deep as you can go in an animated movie–with the exception, maybe, being Toy Story. There’s not really anything that doesn’t work. This is an amazing family film that both parents and kids will enjoy. Another Pixar classic. The premise is ridiculous, but this ode to former child actors is really a fun watch with some pretty entertaining references. The problems lie in the fact that half way through you forget that it’s even about former child stars and the issues that come with it because it starts focusing too much on the relationship between Dickie and his new family. It relies too heavily on its saccharine resolutions and doesn’t have enough deserved tension beforehand to make it as worthwhile as it should be. Basically, it’s too heartwarming too often–don’t get me wrong, it might bring smiles to your face, but in hindsight you wish that there was more at stake. It’s also has a lot of plot holes–such as how did the mom know that Dickie used to play Candy Land with his dad? And if the Finney family doesn’t have much money then how can they afford to fix the house when the water bed floods and destroys it? It also doesn’t clarify Dickie’s money situation and doesn’t show him hitting the rock bottom that it could have. Not to mention much of the character depth is paper thin or uneven. Much of the film is completely unbelievable and caddywhompus. And David Spade plays the same pervy character that he always plays so much so that you forget that he’s not playing himself. Films like this are enjoyable still because of their novelty. 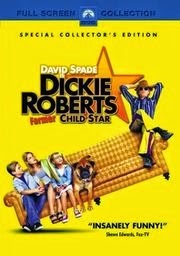 It’s an idea that isn’t really tapped into, and it does showcase David Spade’s talent decently well. Not as mindless as it probably should be, the final act in Rodriguez’ Mexico Trilogy is only slightly better than the previous film, Desperado. The movie has some really good scenes and lines, but the screenplay is full of things that don’t make sense at times. Like, why were they fighting with Marquez to begin with? And when and why was Carolina with Marquez? And why was there hardly any emphasis on their daughter and her being murdered? El Mariachi seemed more concerned about his wife and appeared to have forgotten that his daughter was also killed. A lot was happening in this film and there seemed to not be enough initial motive for the characters besides the fact that this film was about to happen. 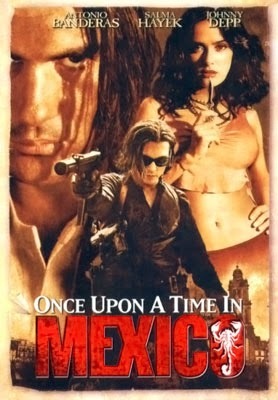 However, Once Upon a Time in Mexico was more enjoyable than the 2nd act of this trilogy and the acting and characters were amazing. This is definitely the creepiest of all three films. Depp stole the show as Sands and a lot of the supporting characters were very interesting and good. However, the main character hardly seemed to get very much screen time. Also, I kinda wished that they had revisited the boy from the 2nd film that El Mariachi saved and brought to the hospital. It would have been nice to see some of that carryover from the previous movie. After so much being wrong with this film, I still couldn’t help but get into it because Rodriguez has strung together a technical masterpiece here.